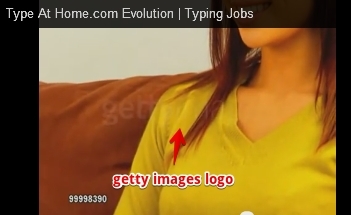 Rating: 1 It's yet another home typing jobs scam. The Good: The website is brief and to the point. You can scan through the four or so web pages in just minutes. 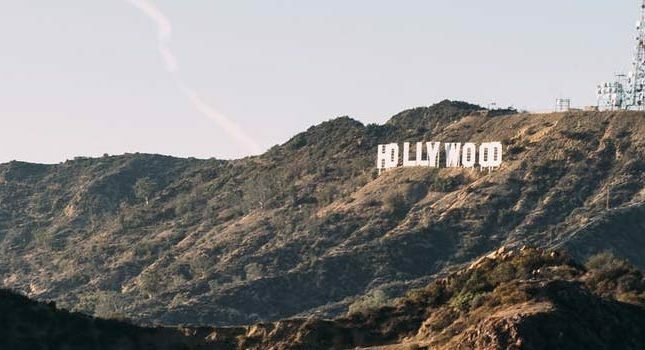 The Bad: The site publishes fake reviews, complete with fake comments, that claim you can make lots of easy money by typing at home. The Bottom Line: You won't make $175, or even $17, with Type at Home. Stay far away from this latest iteration of a home typing jobs scam. Can you really make $45, $75 and $175 for completing typing assignments? That’s what the site TypeatHome.com claims you can do when you sign up and pay one or more of their kits. What is Type at Home all about? The storyline starts out as follows: TypeatHome, or TAH, obtains typing work from “daily profit companies” such as Home Depot, AT&T, Netflix, etc. It then passes on those typing jobs to its trained typists, who work either on a full-time or part-time basis to complete their assignments. Part-time and full-time typists earn $45 and $75 per completed assignment, respectively. 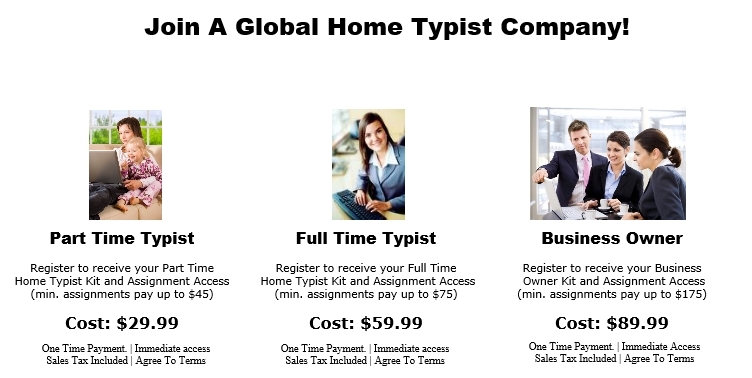 Business owner typists make $175 per completed assignment. Before you can get started on these high-paying assignments, you’ll first need to purchase your appropriate training kit. The prices of these kits are $29.99, $59.99 and $89.99. Once you pay for your kit, you gain access to a series of training videos that help you prepare for your new career as a stay-at-home typist. You are also given a detailed, 1-2 hour long assessment at the end of your training. After you pass your assessment, you are provided with a list of typing jobs. Register for a position with TAH (in 5 minutes). Complete a basic training course (in 30 minutes). Complete your first assignment and email it to us for payment. 1. The website is filled with typos and stolen content. Likewise, if you watch this video’s footage, there is a point where a bleed-through copyright notice comes through from Getty images. This tells me that TAH is blatantly stealing stock photo content. 2. 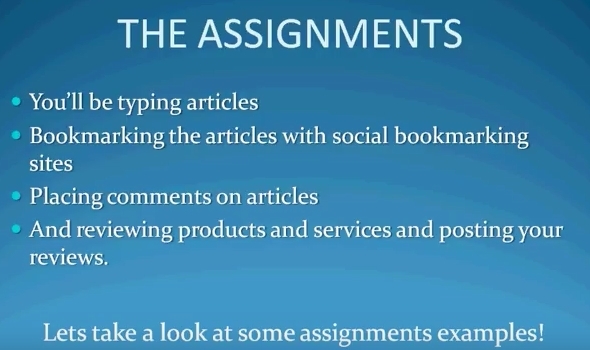 The ‘assignments’ are fake. So far, everything sounds believable. However, TAH then showcases one example article that it claims paid out $75 to its typist. The article is a HubPages post. To begin with, HubPages is a revenue-share content aggregator that does not pay upfront for content. I should know because I wrote for this site for several years. 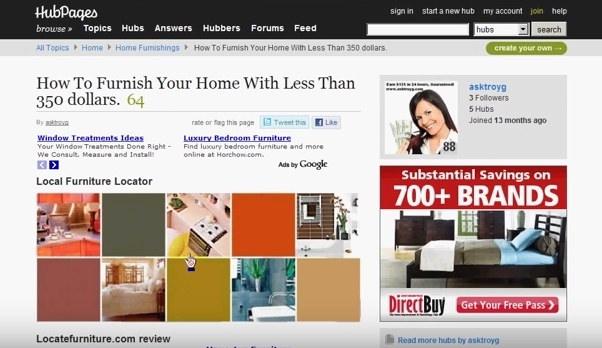 However, let’s assume that the actual company that paid the $75 was LocateFurniture.com, not HubPages. If you search on LocateFurniture.com, you’ll come across an ad-heavy website that has just two pages of content and very little useful information. I highly doubt that this site ever paid a typist even $20 for content. More than likely, this site was hastily created by TAH to stand in as an example of a well-paying client company. 3. The customer complaints tell a different story. If you look up online reviews of TAH, you’ll come across many of its unhappy customers. These customers note how they paid the up-front fee to TAH and expected to receive actual job listings from the company. Instead, what they received was either non-access to the members’ area or typing assignments that paid little to no money. 4. You shouldn’t have to pay for a job. Legitimate employers and clients don’t have you paying money to secure work. If you have to pay money to obtain a job, there’s a good chance that job doesn’t exist or is a scam. What’s the reality behind TAH? Type at home “job opportunities,” of which TAH is a part, entice you with offers of big money for little work that you can do right from home. Once you pay the membership fee, you receive access to poorly compiled training materials that are designed to keep you busy so you delay getting a refund. After you “graduate,” the program provides you with the highly anticipated job leads…except that the leads aren’t really for actual jobs. Instead, you receive a list of companies and businesses that you need to solicit for typing work. Unsurprisingly, those companies have no idea that they’ve been featured on a third-party list for typing jobs. 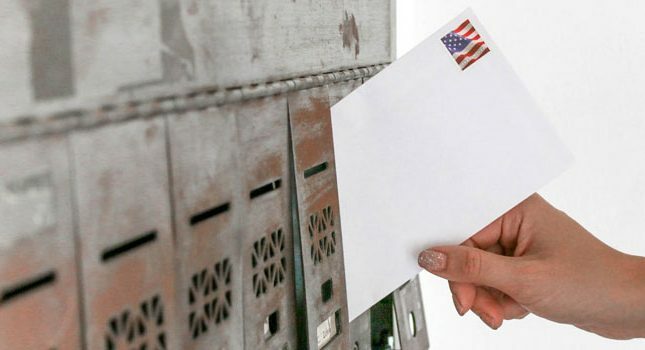 Type at home scammers evade legal issues by stating that they are making you aware of job opportunities, not actual jobs. In the case of TAH, Troy Gri (the site’s creator) of Prana Systems, LLC defends his scheming ways by stating that typists hired with TAH are actually sub-contractors. As such, they receive their assignments through Troy. However, for its supposed 17-year history, there is not a single authentic account of any TAH sub-contractor getting paid. Instead, you see a long list of customer complaints about the lack of real typing assignments, and/or non-payment of requested refunds. Whenever a work-at-home company asks you to pay money up-front and in exchange for a job, your suspicions should be instantly raised. In the case of TAH, not only does the company not deliver what it advertises, but it engages in outright plagiarism of online content. You are best advised to stay away from this online scam.